A high-school boy is given the chance to write a story for Rolling Stone Magazine about an up-and-coming rock band as he accompanies it on their concert tour. Opening Weekend: $2,314,646 on 131 Screens. When I grow up, I want to be Cameron Crowe. Okay, I’m already 49, so physically, I’m clearly as mature as I’m going to get. (My level of emotional maturity remains questionable.) And if push came to shove and you forced me to pick someone whose life I’d like to have, it’d probably be a big rock star like Mick Jagger. But success on the level of Jagger or whoever never seemed attainable, whereas I theoretically could have seen myself following in Crowe’s footsteps. Like Crowe, I possessed an intense love for rock music as a teen, and I also wanted to pursue a career in journalism. However, I burned out on the latter during high school and abandoned those plans before college. I also lacked Crowe’s apparent sense of ambition. What can I say? I’m a lazy SOB! But I must admit I feel a definite connection with Crowe’s story, and that helped make Almost Famous all the more special to me. A barely-obscured autobiography of the director’s early career, Famous briefly features Crowe’s doppelganger William Miller as an almost adolescent. At that point played by Michael Angarno, we meet his erratically strict mother Elaine (Frances McDormand) and his older sister Anita (Zooey Deschanel) as well. Anita feels stifled under Elaine’s rules, so she leaves home at 18 to become a flight attendant. Before she splits, however, she alerts William to her secret stash of rock albums, something she kept hidden because Elaine didn’t allow them in the house. We then flash forward a few years to 1973 and meet 15-year-old William (Patrick Fugit). Anita’s record collection did the trick, and he tries to combine his dual loves of music and journalism into the same package. He meets iconoclastic rock journalist Lester Bangs (Philip Seymour Hoffman) and gets the writer to mentor him to a degree. This nabs William his first professional job, as he gets the assignment to interview Black Sabbath at the local arena. However, things don’t go well, and the boorish security won’t allow William to enter despite the presence of his name on the right list. Fortuitously, he meets a group of self-described “Band Aids”, women who follow certain acts but who definitely don’t consider themselves to be groupies; they may sleep with the performers, but they see themselves as muses and they care about the music, not the lifestyle. Key among these women, Penny Lane (Kate Hudson) takes an immediate shine to William and facilitates his entrance backstage. She also introduces him to the members of Stillwater, an up-and-coming band who opened for Sabbath. After the event, his Creem article attracts the attention of Rolling Stone magazine, and they hire him to travel with Stillwater and write an extended piece about the band. Most of Famous consists of what happens to William as part of that job. It starts as a brief assignment, but he becomes intoxicated with life on the road. He clearly idolizes Stillwater, with a particular emphasis on charismatic lead guitarist Russell Hammond (Billy Crudup). William also develops a serious crush on Penny, a fact complicated by Russell’s fitful affair with her. In addition, internecine band tensions threaten to split the group on the cusp of their commercial breakthrough; lead singer Jeff Bebe (Jason Lee) grows more and more jealous of all the attention that Russell attracts. All of this makes Almost Famous sound a lot like a soap opera, but the truth couldn’t be much more different. Sure, the film contains lots of interpersonal drama, but Crowe develops these threads in a natural and understated manner. Famous never makes a big deal of the different relationships and their effects on each other. Instead, they occur in fairly quiet and realistic ways that help make the characters seem more believable. I won’t go so far to state that Famous feels like a tour diary, but it comes close. Crowe doesn’t attempt to give it a documentary feel, but the film always comes across as real – heartbreakingly so at times. To a certain extent, Crowe glamorizes the early Seventies rock scene. He consciously omits most references to drugs, and we don’t see much debauchery on the part of the musicians. Indeed, it’s the women who take control in that domain; while some scenes show the way the musicians viewed the women as a commodity, much of the time we watch them from a position of power. All of this makes sense because Famous firmly comes from William’s point of view. Crowe doesn’t attempt to create a strictly factual “exposé” of touring rock bands circa 1973. Instead, he wants to take the traditional “coming of age” genre and give it his own spin. And that makes Famous all the more endearing. The absence of almost all cynicism allows the flick to take hold of the viewer with an emotional resonance that seems unusual in this day and age. So many films prefer a detached sense of irony to maintain some vague aura of “cool”, but Crowe appears secure enough to indulge his nostalgia unabashedly. That doesn’t mean that he indulges in sentimentality, though. Famous manages to have its cake and eat it too. The movie offers a warm and charming atmosphere that never appears to become gushy or sappy. Instead, Famous stays with a light but lovely tone that makes the piece satisfying. Famous enjoys a terrific cast who all offer topnotch work. Hudson earned an Oscar nod for her performance as Penny Lane, but it seemed somewhat unfair that the Academy singled her out and ignored the others. All of the actors appear so wonderful that it becomes hard to pick a winner. There’s not a weak link in the bunch. While a working knowledge of the early Seventies rock scene makes Famous more enjoyable, I don’t think it requires such foreknowledge. However, I can’t really judge that issue, as I do know a fair amount about the era. God knows we’ve seen many “coming of age” flicks over the years, but few seem as real and special as Almost Famous. The movie manages a level of heart and honesty unusual for the genre, and it provides a consistently warm and lovely delight. A rock movie that spreads beyond those limits, Almost Famous works a magic spell that makes it a true winner. This package presents Untitled, what Crowe calls “the movie that became Almost Famous”. Indeed, it really is Almost Famous, except it adds about 40 minutes worth of material. While I enjoyed this glimpse of the added footage, I didn’t think these segments made Famous a better film. Actually, I felt some of it undermined the project and made it a little less effective. We now see more of 11-year-old William in scenes that try to better illustrate his sense of disconnection with his classmates. However, these seem unnecessary. We already get it that he’s both smarter and younger than the other kids; the extra shots can be amusing, but they also appear redundant. In addition, Untitled packs quite a few “star-spotting” moments that take the focus off of the main characters and make the movie feel more celebrity obsessed. Ultimately, Untitled offers a moderately entertaining look at an alternate Famous, but it remains distinctly less satisfying. The flick appears more self-indulgent, and it also seems to run too long. The project comes across as less tight and distinct. The extra sequences don’t badly harm the film, but I prefer the leaner and more focused theatrical cut. I respect and admire Crowe’s decision to give us Untitled, though. He reveals his enduring rock fan with his choice to refer to Untitled as a “bootleg” package, for the set attempts to come across like an unauthorized release meant to satisfy die-hard partisans. Never does Crowe attempt to convince us that Untitled betters or usurps the theatrical Famous. Instead, he just wants to let us see the whole process, and I appreciate his decision to do this, even if I don’t care so much for Untitled. Almost Famous: Untitled appears in an aspect ratio of approximately 1.85:1 on this Blu-ray Disc. The picture seemed inconsistent. Sharpness varied. Much of the film showed good delineation and accuracy, but exceptions occurred, so some parts of the movie came across as a bit flat and soft. Light edge haloes occasionally complicated that side of things and left us with a mild lack of accuracy at times. Other than during the opening credits, jagged edges and moiré effects created no concerns, but some digital noise reduction gave the movie a bland feel on occasion. In terms of print flaws, I saw a smattering of specks but nothing bad. Famous provided a naturalistic palette, and the disc usually replicated these tones well. However, the noise reduction could give the colors something of a flat feel. Nonetheless, the hues generally worked fine. Black levels also seemed deep and dense, while shadow detail was logically opaque without any excessive thickness. Parts of the film looked very good, but the image was too inconsistent for a grade over a “B-“. Though it lacked much ambition, the DTS-HD MA 5.1 soundtrack of Almost Famous largely satisfied. Not surprisingly, the mix maintained a fairly heavy emphasis on the forward channels. Music dominated the proceedings, as both score and songs demonstrated very good stereo delineation. Effects stayed largely in the realm of ambience. Those elements gave us a general feeling of atmosphere but not much more for the most part. Most of the time, surround usage stayed limited to that realm. The track replicated concert hall acoustics neatly, and the mix kicked to life neatly during the scene with the electrical storm on the airplane. Otherwise, Famous remained pretty subdued. Audio quality appeared positive. Dialogue sounded natural and warm, and I noticed no problems related to intelligibility or edginess. Effects were accurate and distinct. They showed no signs of distortion, and they came across as appropriately dynamic and vivid. Most importantly, music sounded rich and replicated the original recordings with good fidelity. The songs and score showed tight bass and clear highs, and they worked well. 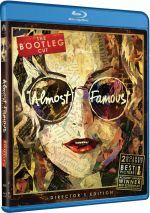 Ultimately, the audio of Almost Famous lacked enough ambition to earn more than a “B”, but it worked well for this film. 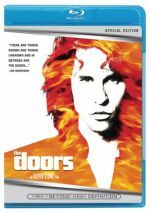 How did the Blu-ray compare to the 2001 DVD? Audio was fuller and peppier, while visuals seemed more accurate. While I wasn’t wild about the image, it topped the DVD. 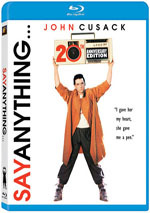 The Blu-ray replicates most of the DVD’s extras, and we start with an audio commentary from director Cameron Crowe along with his mother Alice; they offer a running, screen-specific piece. The track also features a crowd of others such as Scott Martin and Andy Fisher of Vinyl Films, family friend Ivan Corona, and Mark Atkinson from DreamWorks, but they seem to be there mainly in a production capacity; we hear from them a couple of times, but they don’t offer much material. That’s appropriate, especially since the Crowes give us so many interesting remarks. Make no mistake: this remains Cameron’s commentary. His mother chimes in with reasonable frequency to offer her take on facts or the film, but Cameron dominates the piece. Together they make this a wonderful track. Cameron relates many of the facts behind the fiction, and he expands on scenarios seen in the film. Cameron also discusses period elements and tries to give us a good background for his efforts. Of course, he tosses in a lot of film-specific remarks about the flick. From the additions to the new cut to working with the actors to a mix of other elements, the director relates a lot of great notes. Between the extensive personal statements and the movie-related background, we hear scads of terrific information about Almost Famous. I felt fascinated from start to finish; this was an excellent track. When we move to the set’s “Special Features” area, we locate a quick Introduction from Cameron Crowe. We then find an Interview with Lester Bangs. This one-minute, 55-second clip shows the critic as he discusses topics like Jethro Tull, Bryan Ferry, and Emerson, Lake and Palmer. Apparently from around the mid-Seventies, the piece seems very entertaining but too brief. Another useful Crowe introduction leads into Love Comes and Goes. A three-minute, 45-second video compiled by Scott Martin, we hear the demo tune sung by Nancy Wilson in her “man voice”. Behind the scenes footage accompanies the track, and it seems more interesting musically than visually; the snippets from the set appear somewhat bland. We also find a more “standard” music video for Fever Dog. This one simply compiles movie scenes, mostly from concert segments. It’s forgettable. More of that sort of footage appears in B-Sides. This five-minute, 21-second piece shows digital video material shot by Crowe and Scott Martin, and it begins with yet another introduction from the director. The images come across as moderately intriguing but nothing more than that. Next we find a text program. Rolling Stone Articles starts with another quick intro from Crowe, and we then can choose from seven works he wrote. These include pieces about the Allman Brothers, Led Zeppelin, Neil Young, Peter Frampton, Fleetwood Mac, Van Morrison, and Joni Mitchell. A very nice extra, the “Articles” are fun to read and help us see Crowe’s history better. The Making of Almost Famous runs 24 minutes, 50 seconds and includes info from Crowe, composer/songwriter Nancy Wilson, Rolling Stone editor/publisher Jann Wenner, music supervisor Dannny Bramson, photographer Neal Preston, technical consultant Clay Griffith, and actors Philip Seymour Hoffman, Patrick Fugit, Kate Hudson, Anna Paquin, Fairuza Balk, Frances McDormand, Peter Frampton, Jason Lee, Billy Crudup, John Fedevich, and Mark Kozelek. The show looks at the movie’s story/character areas and autobiographical elements, cast and performances, music and band training, locations and sets, and general thoughts about the film. Crowe covers some of this in the commentary, but it’s good to get additional perspectives and this turns into a useful piece. Cameron Crowe’s Top Albums of 1973 provides a look through the director’s favorites from the year featured in Famous. We hear the director relate brief thoughts about the Allman Brothers’ Brothers and Sisters, David Bowie’s Aladdin Sane, Jackson Browne’s Late for the Sky, Bruce Springsteen’s Greetings From Asbury Park N.J., the Who’s Odds and Sods, Todd Rundgren’s Something/Anything, Elton John’s Honky Chateau, Led Zeppelin’s Houses of the Holy, Joni Mitchell’s For the Roses, and the Rolling Stones Goat’s Head Soup. I’d quibble with some of his choices; Bruce’s The Wild, the Innocent and the E Street Shuffle easily tops Greetings, the omission of the Who’s Quadrophenia seems odd, and Honky Chateau came out in 1972, which makes me wonder why he left out Elton’s Goodbye Yellow Brick Road, which did arrive in 1973. Nonetheless, it’s not my list, so Crowe can do what he wants, and this piece seems fun. Cleveland Concert starts with another introduction from Crowe before we see the whole performance as filmed for the movie. This piece lasts 15 minutes, 45 seconds and includes three songs: “Love Comes and Goes”, “Hour of Need”, and “You Had to Be There”. Essentially an extended collection of deleted material, it’s entertaining to check out more of the band’s “live” performing. More unused footage appears in Small Time Blues. This two-minute and 55-second clip shows William as he eavesdrops on a hotel room performance of the song. Had it gone into the movie, it would have slowed the pace, but it offers a charming extra for the disc. Our last package of deleted material provides one of the most interesting bits. Stairway starts with another intro from Crowe, who explains why the clip didn’t make either the theatrical or Untitled cuts. We see William as he uses Zeppelin’s “Stairway to Heaven” to convince his mom that rock music’s worthwhile. As Crowe explains, however, he didn’t get the rights to the song, so he advises you to synch up the disc with the tune to experience the scene as intended. I didn’t try that, but the segment seems intriguing nonetheless, though it goes on too long. At 12 minutes and 13 seconds, it contains the whole album take of “Stairway”, and it definitely would have made the movie drag. Still, it’s fun to find it here. In addition to the film’s theatrical trailer, we locate its script. You can still frame through the entire screenplay in this cool supplement. The Blu-ray drops some text materials and a Stillwater CD from the DVD package, but the biggest omission comes from the absence of the movie’s theatrical cut. That’s a big loss; I prefer the shorter version and feel disappointed I can’t see it on Blu-ray. Almost Famous became one of the sweetest and more ingratiating films of 2000, and it possesses a particular resonance for those of us with a heavy interest in rock music. What could have been little more than a coming of age story dressed up in classic rock clothes, Famous instead offered a light and lovely tale that earned honest emotion without any sickly sentimentality. The Blu-ray brings us erratic but generally good visuals along with pretty positive audio and bonus materials. It’s unfortunate that the Blu-ray lacks the theatrical cut of the film, but for fans of the longer version, it’s the way to go.